Caption slip reads: "Photographer: Wyman. Date:1954-6-21. Reporter: West. Assignment: Man found murdered in auto, 4100 blk. Brooklyn Ave, E.L.A. 43/44: Sheriff's detectives remove body of Joseph Hinojosa from car. 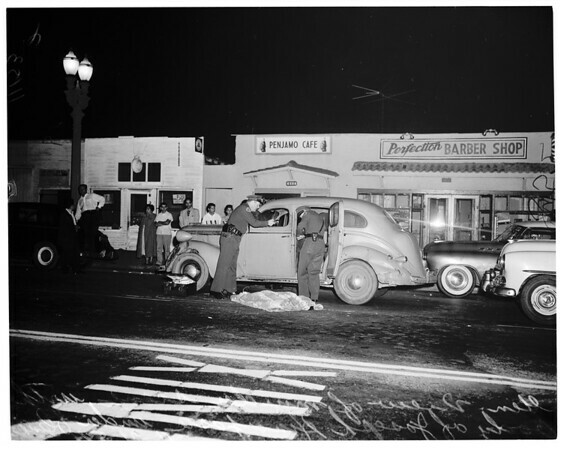 51/52: Gen. view of scene, with Joseph Hinijosa's body under blanket. 5/6: Dep. Sher. Fred Fox leads away Mary Acuna, to be questioned. She blew her top over questions".